Hi! This is the last of the chakra blogs, the crown chakra. I've been sharing all about the seven chakras in the previous blogs-you can catch up with them here! Teaching about the chakras is part of my upcoming Reiki Level I & II Course and as a Reiki Master and Teacher, the chakras have always fascinated me and I love to share what I can about them with passion! What and where is the crown chakra? The crown chakra is the highest of the seven chakras within the body. It is located at the top of the head, at the crown of your head! Chakras are most commonly associated with being shaped like two inverted funnels; the widest part pointing out, the narrowest part pointing towards the body, front and back. In the case of the crown chakra, mush like the root chakra it is most commonly agreed that there is only one funnel, pointing up to Source/Heaven/God/Universe/Space [delete as appropriate] at the widest point. 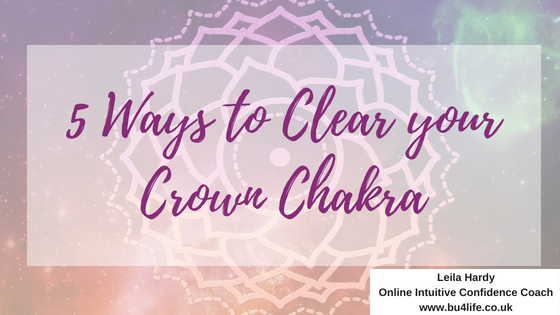 The crown chakra is connected to the energy vibrations of faith, spirit, peace, connection, presence and seeing your own potential when energy flows through a clear and balanced crown chakra. When imbalanced or blocked, the vibration may be one of confusion, disconnection from yourself, others and your intuition, lack of purpose or direction, feeling disillusioned. You may find meditating difficult, or be struggling to identify your purpose in life. Colour: The crown chakra, is most commonly associated with the colour violet, although I encourage all my Reiki students to use their own intuition to create a picture of what the crown chakra looks and feels like for them. But wearing violet or purple clothes, underwear (if you are not a big fan of wearing bright colours like me!) and jewellery are great ways to support the energy of the crown chakra. Gratitude: Expressing gratitude and acknowledging the presence of being a part of something much bigger than yourself is a powerful way to cleanse and recharge your crown chakra. When you can come from this perspective, all set-backs and challenges become much more insignificant and you can offer gratitude for them in knowing that you are always supported and guided by these instances as they become your greatest teachers. Reiki: Reiki really helped me to access my intuition and clear and open my crown chakra. Using Reiki, you can clear your crown chakra and maintain the balance by allowing Reiki energy to flow from your hands cupped over the crown of your head to the crown chakra area, noticing and observing any change of sensations or feelings that you experience. Hypnosis: Moving into an alpha brainwave state can really support you to access and clear your crown chakra, using a guided hypnosis or meditation, you can be taken through journey of exploring and connecting with your crown chakra and all the possibilities and potential you can tap into when your crown chakra is clear! Essential Oils: Sandalwood, Jasmine, Lavendar and Frankincense are all powerhouse essential oils for your crown chakra. They promote sleep, deepen meditation, strengthen your intuition and increase mental clarity. Diffuse or dot onto the crown of your head (if a safe and supported essential oil is used, like Young Living Oils). I am at peace. I am one with all beings. What have you found useful about this series of blogs about the chakras? Have you learned something new? If you are interested in learning more about chakras and how Reiki can support them for you and/or the clients you are working with, then its not too late to book your place on my Reiki Level I & II course now! where I'll be covering chakras, as well as teaching and attuning you to Reiki Level I & II!